Rajasthan is the land of Rajputana Heritage, a land of courageous people with royal blood and traditional lifestyle. The beauty of Rajasthan lies in its beautiful palaces, forts, mansions and deserts. The magnificent and imposing forts and palaces bear evidence of the royal times. 'Tour itineraries for Rajasthan' offer the opportunity to relive and experience the grandeur of this majestic destination. The legacies and customs of Rajasthan are a reminder of the sophisticated lifestyles and richness of the Maharajas of this land. There is much to explore in Rajasthan. The cities and palaces of Rajasthan with their divine cultural offer a lot of excitement and fun for tourists. Tour itineraries for Rajasthan include many lucrative packages that attract tourists coming from all over the world. The reasonable rate of the tours is the main attraction amongst others. The various tours come at a very low price, which can be afforded even by the budget travelers. Most of the tours cover the main attractions within the city and some of the important nearby destinations. Tour operator's spread all over India and abroad offer great itineraries for Rajasthan. These itineraries can be for a short duration as well as long one's as per your convenience. Most tour operators offer as short as 3 days to even a month long tour to Rajasthan covering most of the interesting destinations of Rajasthan. 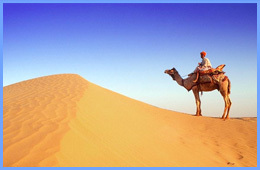 India Profile offers online booking of Rajasthan Tour Packages.